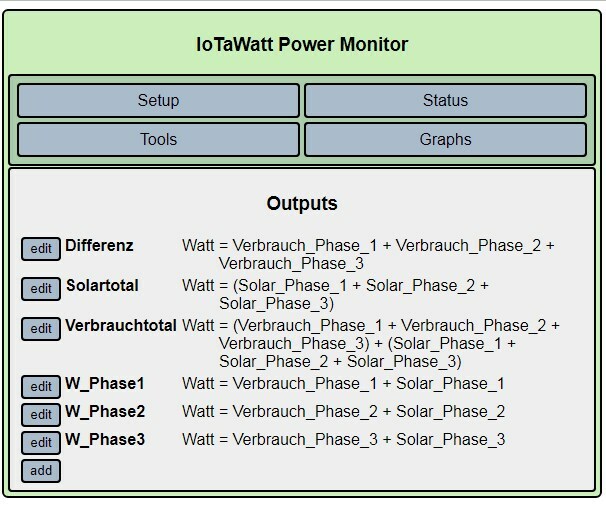 Could it be that the iotawatt is partly also measuring the solar energy which you are directly using? 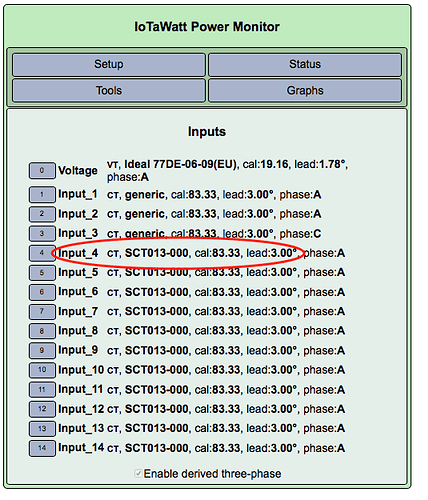 No, the SCT13 are direct before the energymeter from the power company. Where can I get this 3° shift factor and if it is plus or minus? Ok, I think I still have not quite understood your setup. What kind of energy meter is it? Does it also count the exported solar energy (two way meter)? In the case of exporting energy the power would be negative, is that the case? 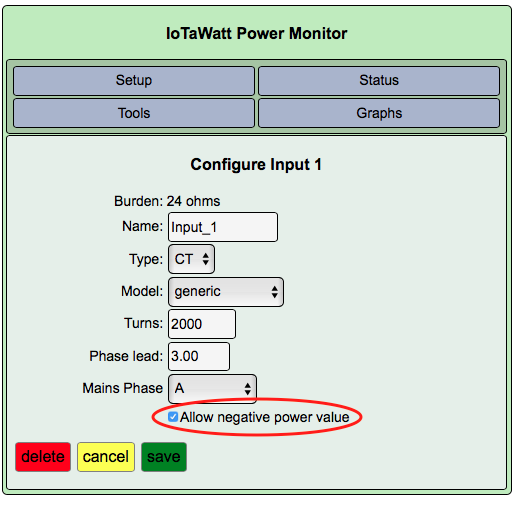 Is the IoTaWatt configured to measure negative numbers? Can you please share some more details about that current transformer, please? A current transformer reduces the current by a factor of 40. I will now adapt this factor and look again at how the result comes out. Is it a CT connected to IotaWatt? It’s preconfigured for this kind of CT. IMHO it’s a delay so it’s a positive number. For clarification: An old picture with the predecessor of IotaWatt. You can’t see the 3 CT’s from solar, they are clipsed close to the meter (higher up). This is the old configuration, it gave me a good result on solar but I was not able to get a predictable value on ‘use’. On the actual configutation I clipsed the CT’s to the main line. Now I have to make a calculation for ‘use’ as ‘solar’ and ‘use’ are on the same lines. And the status, it’s middle of the night, no sun. I have to wait for results to compare it with the meter. Bob Lemaire (@overeasy) has setup a dedicated forum for IotaWatt support and development which can be found here IotaWatt forum . Otherwise Glyn and I will try our best to help with IotaWatt questions asked here in future. Thanks, now I got it. But I think it doesn’t make sence to split it into an other forum. I hope that’s o.K. Thanks for the pictures, that makes it a bit clearer. So you are measuring the secondary current of the installed 200/5A current transformer. Are these current transformers used for the official meter from the electricity company or for what purpose are they? If not where is the officially meter located? 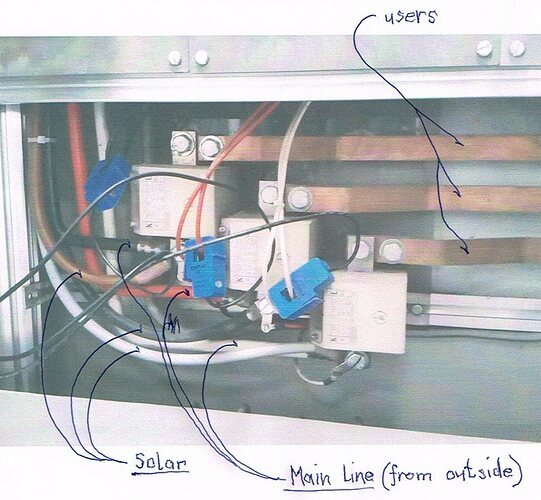 It looks like Solar and Mains are connected together just before the current transformer which are measuring the consumption of the users, is it correct? If you have 100 A YHDC c.t’s on the secondary circuit of a 5 A c.t, you must expect the result to be not accurate. Although the YHDC does work below 5 A, the accuracy is not specified below 5 A and the errors will increase significantly as the current gets smaller. Unfortunately, I cannot think of a 5 A primary split-core c.t. that I can recommend. The SCT006 from the shop should also be good as long as the secondary current does not go higher than 16 A, or not? No, Bill, he’s using the meter c.t’s as interposing c.t’s, their secondary current is 5 A, so we need a c.t. with (ideally) a 5 A primary current capability, not secondary. Unless of course you were thinking of putting the c.t. 's on the busbars. Unless of course you were thinking of putting the c.t. 's on the busbars. 'Twas exactly what I was thinking. I should’ve specified that. Not, I’m afraid. At 5 A primary current, the SCT006 will give only 6.25 mA, so much poorer than the Wattcore. Going around the meter c.t’s is a possibility, if there is room between the busbars to get them in. Can an SCT0750-005 Current Sensor be used on a 30, 50 or even 200 Amp circuit? That looks right. 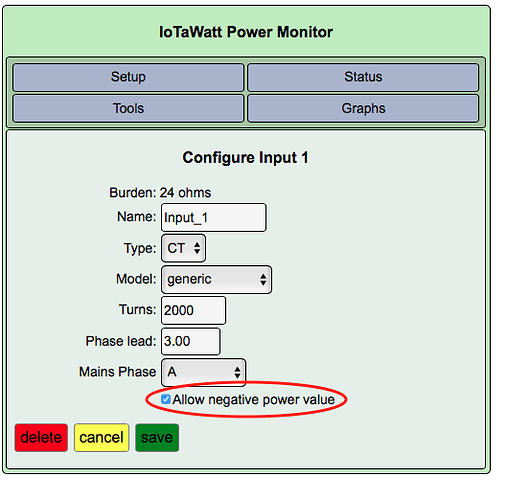 Just be sure the “allow negative power values” are checked for the mains. I’d really encourage you to follow up in the IoTaWatt forum. Yes, this cables are connected direct to the meter. 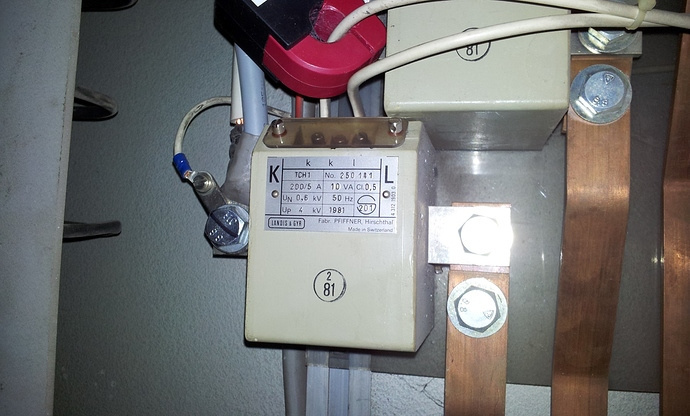 Yes, there is a separate meter for solar and for user (with the current transformer). On the actual configutation I clipsed the CT’s to the main line. That’s probably a good decision, so you are not longer measuring over the 200/5A CT’s. Are you sure your current does not exceed 83 A? That’s the maximum possible current with the SCT013 and the burden resistor in IotaWatt IMHO. I have now measured 1 month again. The measurement of the solar part is almost 100%. But the measurement of the consumer does not correspond with the electricity meter of the electricity plant at all. IotaWatt measures about 50% more energy than the meter from the power company. Today I made a try. I switched off the solar system and started a 15 kW compressor. 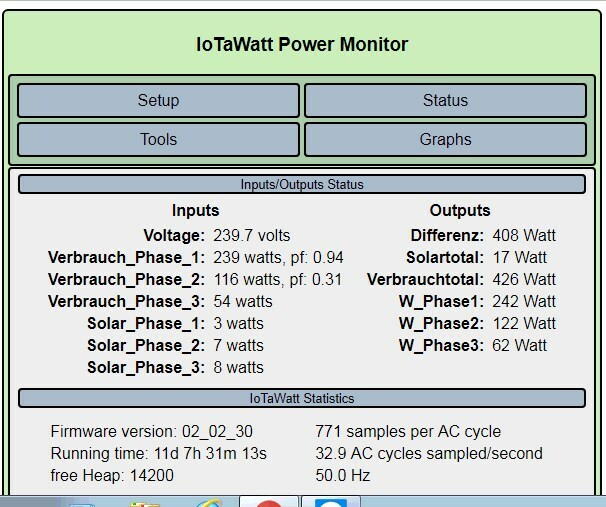 IotaWatt then displayed a power factor of 0.80. Then I switched the solar system on again (about 5 kW power) without compressor and received a Pf 0.99 . Then solar and compressor together. IotaWatt then displayed no Pf . I measure with a VT with Derived Reference. Sensor installation according to type 2. I suspect that the power factor is not measured correctly on two phases. I do not know what I can do. Then solar and compressor together. IotaWatt then displayed no Pf . That’s an interesting finding. There are some API’s that return the phase shift between VT and one of the connected current transformers. They could give some insights into what is actually happening. But to be honest, I’m running out of ideas. Please register at community.iotawatt.com. This allows you to get help from the inventor of Iotawatt.